Creates preview map of all events in current Catalog object. 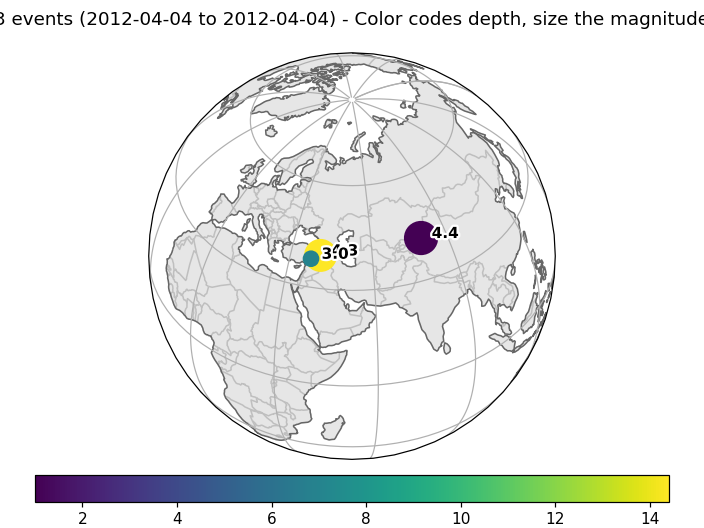 colormap (str, any matplotlib colormap, optional) The colormap for color-coding the events. The event with the smallest property will have the color of one end of the colormap and the event with the biggest property the color of the other end with all other events in between. Defaults to None which will use the default colormap for the date encoding and a colormap going from green over yellow to red for the depth encoding. fig (matplotlib.figure.Figure (or matplotlib.axes.Axes)) Figure instance to reuse, returned from a previous inventory/catalog plot call with method=basemap . If a previous basemap plot is reused, any kwargs regarding the basemap plot setup will be ignored (i.e. projection , resolution , continent_fill_color , water_fill_color ). 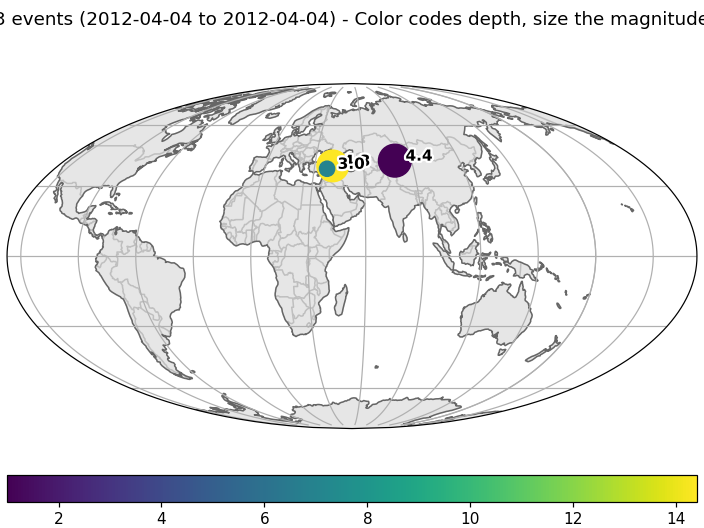 Note that multiple plots using colorbars likely are problematic, but e.g. one station plot (without colorbar) and one event plot (with colorbar) together should work well. If an Axes is supplied, the given axes is used to plot into and no colorbar will be produced. title (str) Title above plot. If left None, an automatic title will be generated. Set to "" for no title.